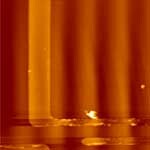 In this chapter, common problems in AFM images are discussed. Some of these artifacts are inherent to the technique, and are impossible to avoid. Others depend on the particular instrument used, or the properties of the probe selected. Some are due to imaging parameters, and can be easily avoided. In each section, the artefact is described, the reason for the appearance of the artifact is discussed, and steps that can be taken to avoid it are given. 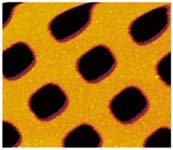 In nearly all cases, there is an illustration of the artefact in a real AFM image. 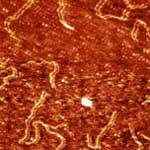 Take this test to see if you can recognise and understand the reason of, common AFM artifacts, and realise how they can be avoided. 1. Which of these two images was taken with a sharp probe? 2. How are probes changed such that artifacts as shown above, where features became dull, can appear? 3. What happens if the probe is at a significant angle to the sample? 4. 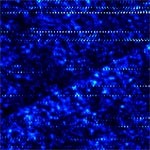 Why could an AFM scanner that was calibrated still make inaccurate measurements? 5. What effect leads to a distortion in the image upon translating the scanning window, as seen below? 6. If the effect shown in question 5 is seen, what can be done? 7. What is the name of the artifact shown below, and the likely cause? 8. What gives rise to the curvature in the image and line profile shown below? 9. How can the effect seen above be removed from the image? 10. What processing steps can give rise to image artifacts? 11. How can vibration noise be removed? 12. How can the user check for incorrect PID settings? 13. What has caused the high frequency spikes seen in the image below? 14. Why are z angle measurements normally inaccurate? 15. What gives rise to the vertical “waves” In the image below. How can they be avoided?